We want to clarify a few things with you regarding the workflow and plans. We would like to recognize, that even with many tries to deal with the pending tasks, we have seen ourselves overwhelmed with the workload and by the weight of everything that had to be done. Because of this we have mostly focused on the same: High End game and stability. We believe we failed with managing some PvP related aspects, as well as communication. Other areas of the game have been delayed or postponed with the hope of finding a good moment where we could have more time to focus on their management. So it is our intention with this announcement, to inform the community that we are already taking the relevant measures in order to correct all this now, with the majority of the high end raids being stable and in really good shape. We would love to give you more feedback with changelogs and suitable reports about what is going on, bringing the community together and improving the other areas of the game that have been stagnant, as well as increasing the support with trusted people in our ranks. We have been always a small team, we had some setbacks since the beginning and we keep the thought that even if the workload is unbearable, it will have better results with fewer of us but with total confidence between the team. For this reason there were just a few recruits for the Game Master positions, with strict organization and no new additions unless they have the total trust from me and Malkavia. This is why I was the only developer for most of the time, and when others joined they had no way to push the fixes to the live realm. The internal organization was not the correct one and it has proved itself multiple times that it needed to be changed – it was drastically delaying the workflow. Now, what are our plans to solve these issues? – Since important fixes were delayed in order to push the current raid tier content and avoid conflicts, now is the time to start pushing them to the live realm. For example: Long awaited class fixes. – Fixes have been deployed bit by bit in many areas, with no changelog or notification. But we are already working on the changelogs with incoming fixes to be deployed. The general fix deployment rate will be increased. – There will be regular changelogs from now on (not with every maintenance, but when there are enough corrections to write one) – players must be aware of which hotfixes are being applied. – Two Game Masters: Tyr and Teri, have joined our ranks after a long wait – more incorporations will follow. The ingame assistance should have a noticeable improvement in speed and quality. – Actively punishing all the win-traders and exploiters that are investigated after reports, and confirmed as such. – New internal project structure, so everything is much more agile and easily deployed. – Design a notification schedule about everything that is happening (events, fixes, important changes, PvE Tournaments, Ruby Sanctum’s beta/release…etc). Dalaran-WoW was born from the passion that we have for this game, we have been adapting ourselves to every setback along this journey and we absolutely learn from our mistakes. We love this project and we are devoted to it, we want to give our players the best and we will not stop until that is achieved. Thank you for the constructive criticisms and the love and loyalty that you have shown us, you deserve our best, and we intend to give you that. We are really glad to announce that our first day on Algalon release was a total success. We had an approximate number of 705 active connections one hour after of the release. (If we also add that around 210 were active in Kirin Tor, it is a great number for Dalaran WoW) In one hour there were created 3057 characters, and around 2100 accounts in the first 2 hours. During this day, February 16th, we have reached between both realms more than 1000 active connections at the same time. Of course, as expected we were victim of a DDoS attack, so we had to put our security system on full mode to avoid their threat, the problem was it caused lag and a long log in time for players to get in-game. But they did not accomplish their objective and Algalon was not defeated. Thank you very much for your patience with these issues, we tried to mitigate them as fast and as best as we could. After the past night we are in a smooth and lag-free environment. We hope your journey continues without problems and between everyone make a great community in our server. Keep going for your Realm First achievements! The race is really interesting at this moment! We are really happy to have you as players, the home of the WotLK lovers is getting bigger each day. Since a lot of new incoming people will start to play on Algalon without previously playing on Kirin Tor, we’ll explain in brief words some valuable and interesting data. Rates: x1 rate in everything. Patch evolution: We will not be patching the content, we’ll be “unblocking/releasing” it gradually in consequence to your individual progression. Dungeons and Raids: They will be closed to the personal progression of each particular character, and they will be opened gradually for every player as it was back in the days of Retail. Season: There are going to be active arena seasons which will start from Season 5, and we will keep the current season for several months, linked with their correspondant PvE raid. Random Dungeon Finder: It shall be disabled until Trial of the Crusader is released. Emblems: They will be adapted to the personal progression of each individual character, and will only drop the correspondant emblem of the raid. Refer a Friend: It will be disabled until the Realm First level 80 race/class and Grand Master Professions are taken. You can refer someone who doesn’t have account made on Dalaran WoW here, and in the same moment when all these achievements are earned, all the benefits will become available and active for you and your friend. Heirlooms: They will not be available until the Realm First level 80 race/class and Grand Master Professions are taken. GM Assistance: Take a look on: How to use in-game ticket system properly. Anyway, until all the Realm First Level 80 race/class are taken, we will not offer assistance in completing quests across Northrend. Also we are not permitted to help you out with any daily quests as well. Bug report: You can easily submit your issues here: [url=”https://github.com/dalaranwow/dalaran-wow/issues?state=open”%5DBugtracker. It is placed within the Menu tab. Any report made on Forums will be deleted permanently. Take a look to the proper format to make a report. Tranfers: WILL NEVER BE AVAILABLE FROM ANOTHER PRIVATE SERVER OR RETAIL. Transfers will become active after the Realm Firsts are taken from our realm Kirin Tor, read this restriction list. Ban-hammer:Any kind of a attempt of hacking, exploiting, using Third-party softwares will result into permanent ban. If you are caught hacking, there is going to NO MERCY and ZERO TOLERANCE against any game breakers, there won’t be any absolute chance to EVER appeal the ban after it was delivered. There is also a great risk that all your progression on Kirin Tor, if you had one, will also be lost completely and permanently. Like we said, if you won’t play fair and square, you will have to deal with the permanent ban. We are not going to give multiple chances to anyone, you have one and ONLY ONE chance to play by the rules, so be on your guard and cautious. Ban-hammer’s victims. For any kind of questions regarding this thread, clarifications, doubts, thoughts, suggestions please use the comment section below in our Forum’s post. We’ll answer you as soon as possible. Thank you. As you all know the great adventure of Algalon will begin this Saturday the 15th. The time has been set at 16:00 GMT +1 (Kirin Tor Realm time). As already indicated,we will reward all those who we think that have been really loyal from the day Dalaran-WoW was born. They will have a chance to reserve their characters names on Algalon (apart from those who participated in our advertisement campaign). The selected ones will receive news from us during the following days. We have a huge content improvement for Algalon in comparison of the current state of Kirin Tor, both epic quests being scripted (new quests and old ones improved) and improvements in many general systems (AI, Pathfinding, Line of Sight, Spells/Auras, Roleplays, script improvements in all kind of level dungeons, full scripting of many world NPCs, some bosses mechanics corrections, exploit/crash fixes… etc). The vast majority of quests are working now, and the few that aren’t, they are going to be auto-completed upon taking them (except some special cases) meanwhile we continue working on them. We believe you will enjoy some of the surprises that you may find while leveling. Of course, all this content and improvements will be implemented this week on Kirin Tor as well (some instances may be temporarily disabled to safely apply the changes). There will be no boost available until all the Realm First level 80 (classes, races and grand master professions) are taken. We are implying that not a single player will be able to use the joy and advantage of Heirlooms, Refer a Friend and instant 70 feature on Algalon until the statements above are achieved. In this moment the character transfers from Kirin Tor will be enabled, your character must be at least level 50. Also, if for some reason any player finds an issue meanwhile questing through Northrend, he will not have our assistance in completing those quests since it could bring a huge dis/advantage for other players. This will be active only while the race for the realm firsts are up. Like we just said, most of the quests work and if not, they are mostly set on auto-complete, though there is always a small chance to find something wrong with them. Also, we shall keep ZERO tolerance when it comes to hackers, exploiters and those who think that can take advantage in the Realm First Race. If you are caught hacking, your account, your alt account, any account related to that account will be permanently suspended and there won’t be any chance to appeal it. Which in conclusion means, you will also loose your entire progress on Kirin Tor. There is going to be a huge team of Game Masters patroling all the areas, checking all the possible hackers and believe us: we know the differece between a hack, exploit and a fair play. Play safe and everything will be fine. Decide to play dirty and you shall suffer the consequences. Thank you very much for reading this. Side note: We apologize for the delay and lack of response in these days (mostly me: Lothloryen) on some private messages through the web, even ingame or Premium Tickets. We have been working very hard and without stop on all the preparations for a smooth release and improvements on both realms. Once both realms are up and stable, our personal attention will be as fast as always have been. IMPORTANT: Vote for the gear restriction. Since the start of this project our idea has been to try and give you the opportunity to experience all the WotLK raids in the way they were the moment they were created. No matter when you join the Algalon realm, for every player the first raid will be like it was in it’s hardest form, since no one in the raid will be outgearing the raid itself. This way the feeling of participation in that raid will be much more present than if the rest of your partners are geared with the best gear available in this expansion (3.3.5a). With that we would like to avoid one weekly fast boost until the last available raid, and with that fortify the guild spirit and the guild competition. This way we are trying to increase the partnership amongst players and the specialization in your main character as a jewel born out of a piece of coal, with years to shine as a diamond. We are aware that a lot of our players do not share this feeling, and we do realise that this system could possibly lead to difficulty in progression if others are not helping you progress (guilds should be a big part in this). If everyone would solely focus on their own experience and their own progression, this could lead to a problem for those that have not progressed that far yet. You could say that, in a way, the biggest restriction will be the players themselves and their ways to help newcomers reach the same level of progression as theirs. We believe that guilds can be a very powerful tool in succeeding in this. As we said, the first season will have these restrictions since a lot of time and effort has been put into realising all of these ideas and they are not so easily undone (it will not affect at all to Naxxramas/OS/EoE – Season 5). In other words, even if everyone would agree to change the current state of the Algalon realm, these changes will not be active during the first release. However, now that the work regarding Algalon is done, we are interested in the opinion of the players as to how to proceed with Algalon. If the vast majority of the players feel a different course should be taken, we are willing to consider this. Therefore, we are opening a poll. You will have 4 options to vote for. You must be logged in and you must have at least one level 20 (or higher) character..
Of course, before vote, click here to read how the gear restriction would work , please. Option 1: Keep the current idea of gear and achievement retrictions as it is planned. Option 2: Remove the gear restriction, but let the achievement restriction in order to progress. Option 3: Make a gear restriction less restrictive mixing gears, for example: In order to raid Naxxramas and Ulduar the limit gear will be Ulduar gear, in order to raid ToC and ICC, the limit will be ICC gear. Option 4: I don’t care, I will play or not play regardless any decission. Algalon: How the progression will work. The Systems we will present here will not be changed before the release of Algalon. However, if the community speaks out and there is a general desire to make a specific change in the future, we will listen and consider it. Of course, our systems will continuously being improved and optimized. Algalon´s realm content will be a bit different from Kirin Tor’s, so you can find some things that work on Kirin Tor and that do not work on Algalon, and vice versa. But soon they will be equal, thus improving the content and quality of both realms. If you have any doubts and it has not been explained here, it does imply that it works exactly as in Kirin Tor or as it is supposed to do on the 3.3.5a patch. 1) First Era: The raids and arena seasons will be gradually released and will last as “the current raid/season” for around 3 months (depending on the raid). For example, as soon as Algalon is launched, you will be able to enjoy Naxxramas and arena season 5 for about 3 months (will post exact dates and times with the official release), once the time to open the next tier raid and season arrives, Ulduar and arena season 6 will be opened. There will be an exception with the way to release some of the first 25 player raids. Eg: Once the realm is opened, there will be available only 10-player mode of Naxxramas. Once Kel’Thuzad is defeated on his 10 player mode for the first time, then we will open the 25 player mode. In this way, we avoid rushes to the Realm First of Naxxramas 25 and we grant some time to stabilize the player base so that everyone has the same chances to obtain it. 2) Second and final era: Once all the content is released, there will be a constant and eternal progression. Thanks to the systems we have implemented, Algalon has been designed with certain restrictions and features that allow the players to progress through the content making each raid / arena season a real challenge for everyone. If you want to progress in the game, either through PvE or PvP, you have to earn it and make an effort. –Access restriction: There will be no restriction on accessing the Northrend instances, except: Trial of the Champion, The Forge of Souls, Pit of Saron and The Halls of Reflection. Only those players who met the previous requirements (having progressed through the content prior to these instances), will be able to enter. –Emblems: Emblems of Triumph will be dropped only to those players who have already progressed through the content up to Trial of the Crusader. Example: If your character has progressed up to Ulduar (and has not yet managed to get The Descent into Madness 25 players achievement), he will not receive any type of emblem after defeating bosses on 5 man heroic instances. However, if your character has progressed up to Trial of the Crusader (which means, you have already got the achievements of Naxxramas/Ulduar) then you will be able to loot the emblems of triumph as reward for killing bosses in heroic mode of 5 man instances. –Access restriction: Each raid will require the previous tier raid’s achievement on the same difficulty the player is trying to enter. For example, if you try to enter in Ulduar 10 player mode, you will need to have The Fall of Naxxramas (10 players) . Hence, the same goes to 25 player mode, you will need The Fall of Naxxramas (25 players) if you wish to enter into Ulduar 25 players. –Emblems: Bosses will always drop that raid’s correspondent emblems for everyone. Example: Players get Emblems of Conquest upon killing any boss inside Ulduar, no matter what is the character’s progression. Scenario: Naxxramas 25 players with 213 as the maximum item level allowed (with the exception of Kel’Thuzad 25 items, with item level 226). -Situation 1: There are players in the raid who have NOT yet progressed through Naxxramas 25. No one in the raid can equip an item which level is higher than 213 (except items of Kel’Thuzad 25), if a player which character has progressed up to Trial of the Crusader equips a 232 level item, he will be kicked from the raid and teleported out of the instance. The system will notify him and the whole raid so that everyone knows who and why he has been kicked. With this system, if a player has an item obtained in Ulduar 10 (item level 219), he cannot equip it within Naxxramas if there is at least one member who has not yet progressed enough. However, he could equip an item with 226 item level if it has been droped by Kel’Thuzad 25 players. Situation 2: Each and every one of the players in the raid has progressed through this instance and has obtained the maximum achievement of Naxxramas 25. They can equip the item they want, this raid has earned the right to play Naxxramas as they like. Of course, this is applied to all the raids, so that it will be scalable and coherent. The system we have implemented is complex, dynamic and intelligent. It adapts itself in real time to the raid’s general behavior. It does detect and classify diversity of overall raid’s behavior, as well as the player’s by individually. Exceptional case: Vault of Archavon. 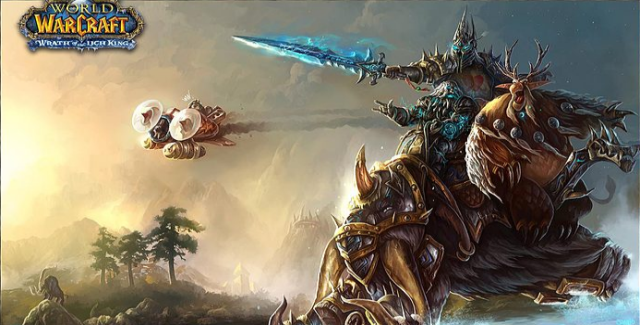 Archavon will be always available, regardless of the players progression as it was released with Naxxramas, thus since the very beginning of the WoTLK. However, Emalon was released as the same time as Ulduar, which implies that he will be available if each and every member has completed the Naxxramas raid. What if there are several players who have not completed it yet? The other bosses are not available for the raid until these players leave the instance, there will be just Archavon. If just one player does not meet the requirements, the bosses will disappear and the instance will configure itself in real time. Other quick example: every raid member has progressed already up to Trial of the Crusader (this means they have Naxxramas/Ulduar achievements), then Vault of Archavon will configure itself and there will be available Archavon, Emalon and Koralon. All vendors have been set and will be adapted to each arena season so that will be impossible to get equipment that does not correspond to the current season. The PvP is subject to constant rotation; it will start in the season 5 and end at 8. When the 8th season ends, we will go back again through season 5. There will be gear restrictions depending on the current arena season. For example, with the release of Algalon the current season will be 5, and there will be no chance that players have items with higher item level than that which correspond to this season or the current High end raid (as I mentioned all PvP vendors in Azeroth/Outlands will be fully configured ). However, once the season have rotated, there will be people who own PvE or PvP high gear ( Eg. Wrathfull or even trinkets like Deathbringer’s will ), but the 5th season would be running again, thus everything will be restricted again with the appropriate level as maximum. Hence, these players cannot equip those items within Arenas, Battlegrounds and Wintegrasp and create an imbalance in regard to those who are not geared yet. With this, we have created a tight and really challenging PvP, where all that the players get, will be hard-earned and always with the same conditions for everyone. -Donations: Of course, as we have stated many times, there would never be high end game gear in our shops. Algalon’s shop will be more restrictive than Kirin Tor one. -Random Dungeon Finder: As already discussed, the random dungeon finder will not be active yet. -Weekly quests: The weekly raid quest will not be available. -The related professions, talents, mechanics… etc will have the same systems specified by the patch 3.3.5a . We will not answer questions that have already been answered or explained in other posts, so please, if you have any questions, be sure you have read all the information. Discuss or inquire in this thread strictly only on how Algalon will work, unrelated posts will be deleted without warning. Finally, we can give you the final release date: Algalon, the WoTLK Progressive Realm will be released during February 15th. We will comunicate the exact hour of the release during the week before. It has been a bit delayed because of many things, but we all will enjoy it anyways.